Originally sized with comfortable margin when handling a 25kg ScanEagle, Hood Tech has recently extended the capacity of its Flying Launch and Recovery System (FLARES) to handle aircraft weighing up to 45kg. 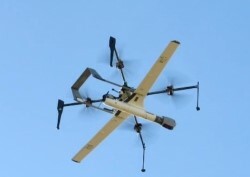 This capacity includes all existing ScanEagle/ScanEagle3 variants. Further, modification to the hosted fixed-wing aircraft is no longer necessary; Hood Tech’s FLARES now sports “airframe grippers” capable of grabbing any of these existing aircraft. Recovery is executed by Skyhook, either with FLARES or with a traditional Skyhook. Hood Tech’s FLARES achieves toughness with excess power: With nominal payload, FLARES hovers at 55% throttle. Excess hover power is available for climbing, for maneuvering against gusty winds, for high/hot operations and for redundancy. Redundancy is further enhanced by FLARES’ 8-motor/8-rotor design. FLARES can be used to replace traditional launcher and Skyhook ground equipment. The combined weight for FLARES launch and recovery equipment is under 200kg. Alternatively, FLARES enables operation from deep clearings as small as a few tens of meters. Recent video of FLARES 2.0 launching and recovering various fixed-wing aircraft is posted at: https://vimeo.com/323583036. Hood Tech Corp., Mechanical Inc. is a privately-owned business active in Hood River, Oregon.